All orders are sent in one package at the same time, if you require some seeds earlier than preordered items, then please place two orders. If you have placed or are placing an order and require a delay to despatch - please email us, rather than write on the safe to leave section - this for for delivery drivers. All seeds will be despatched as soon as possible subject to product availability and payment card authorision. We offer a flat fee delivery charge of 1.39p on all Mainland UK packet seed orders. Orders containing items of weight, such as potatoes, onion sets, garlic bulbs and grower packets are charged according to the delivery weight and delivery charge will be costed as you add the products to your basket. An email will be sent notifying you of despatch. Courier parcels must be signed for at time of delivery, if no person is available to sign the parcel will be taken back to a local depot and a card will be left delivery was attempted. We aim to deliver your order within the following timescales using UK Royal Mail Services. United Kingdom 2-5 working days from despatch. Please note although we ship all our seeds 1st Class, this does not guarantee next day delivery. Royal Mail may take up to 2 weeks to deliver a parcel and only after this period expires can simplyseed.co.uk issue a replacement or refund for non-delivery. Please note: we will ship your order in one go, if you are pre-ordering items that are available for delivery at a later date, then you should place two orders if you require the rest of your order early. For heavy items we use an overnight courier for delivery. 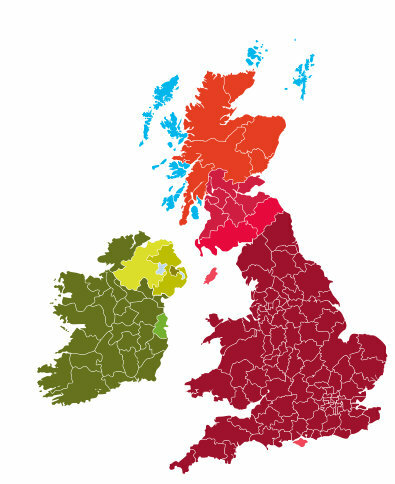 For certain areas of the UK we incur a surcharge which we have to pass on in order to remain profitable, please see the map below for any surcharge applicable for your area. For heavy deliveries in the light blue areas - please contact us before placing your order. A courier surcharge may need to be applied. Apologies - due to the number of packages being lost in transit (particularly in France) we are no longer sending seeds outside of the UK. All goods can be ordered for delivery to a UK address if needed.